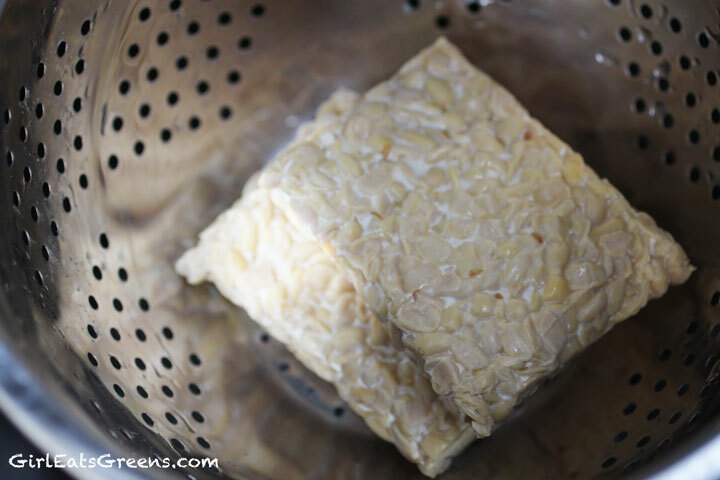 If you’re like me, and find tempeh to be bitter at times, start by steaming the tempeh for about 10 minutes. This doesn’t have to be a fancy process. 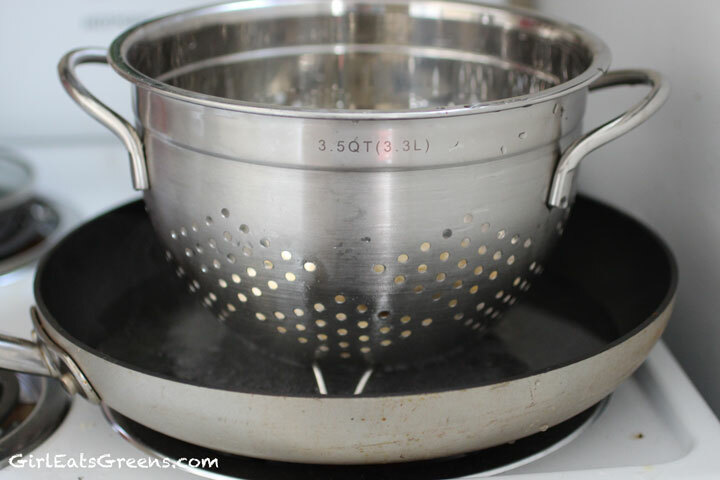 I used a pan and a metal strainer. 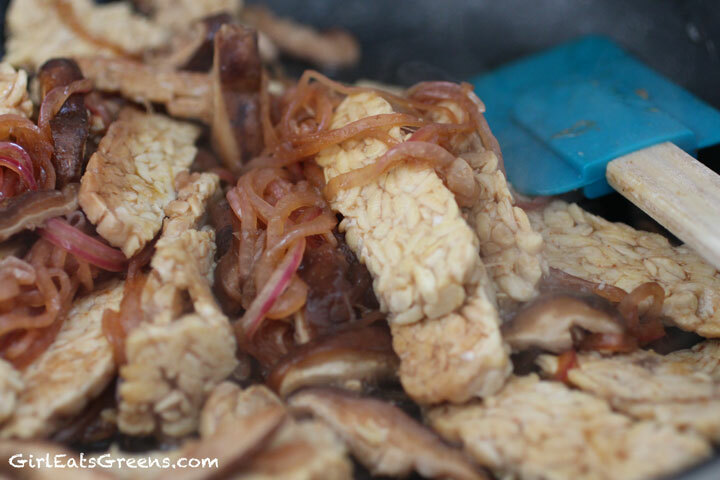 While the tempeh is steaming, go ahead and slice the mushrooms and onions. I was super excited to break out a new kitchen tool for this. 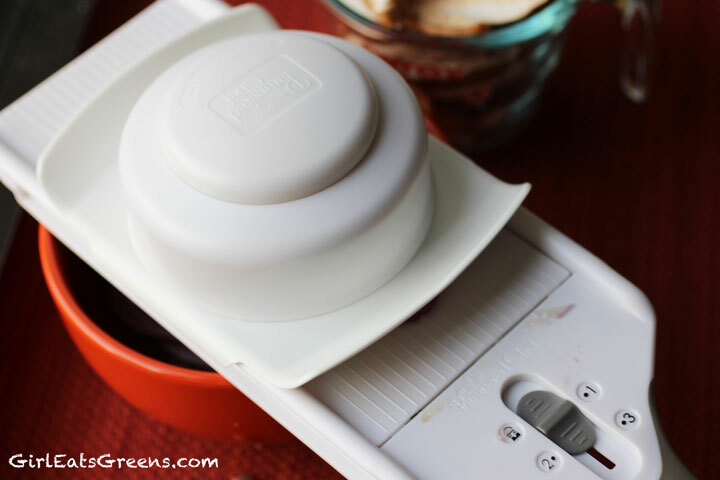 My mom got me this amazing slicer for Christmas and it was perfect for this scenario. 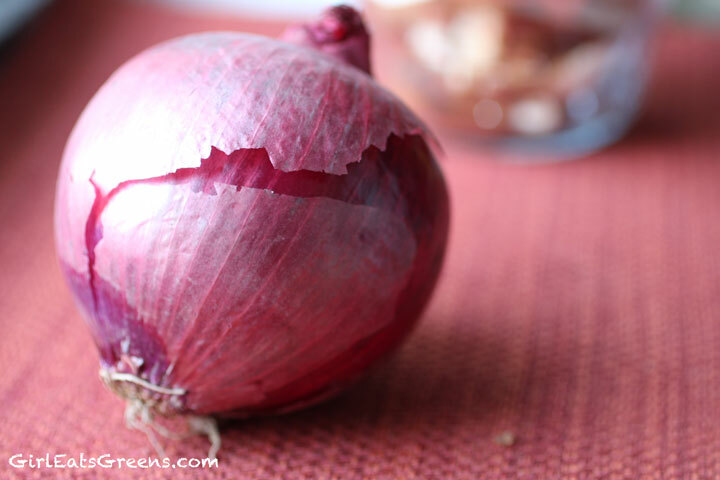 If you don’t have a fancy gadget, just try to slice the onion as thin as you can. 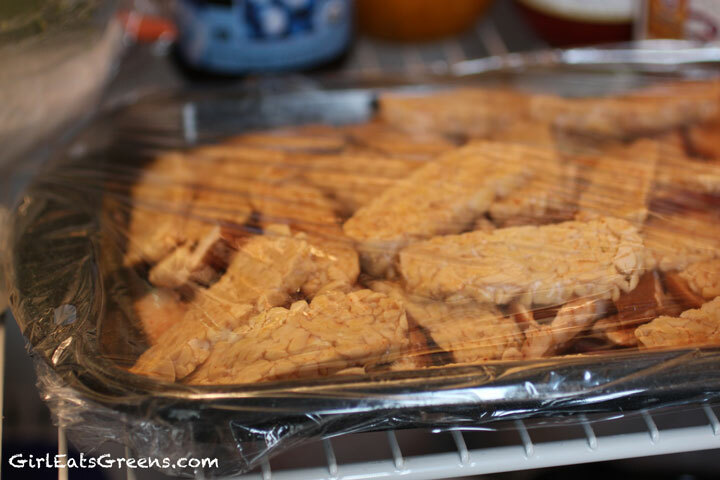 Thinly slice the tempeh when it’s done steaming. 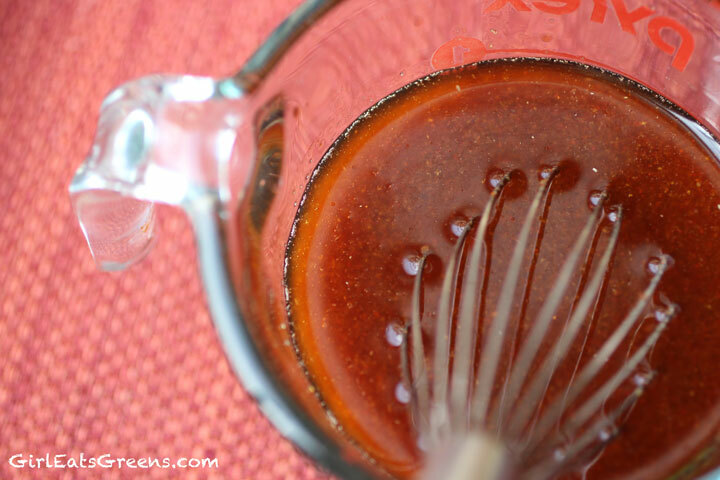 Whisk together the vinegars, soy sauce, garlic powder, cayenne, agave, oil, and liquid smoke. 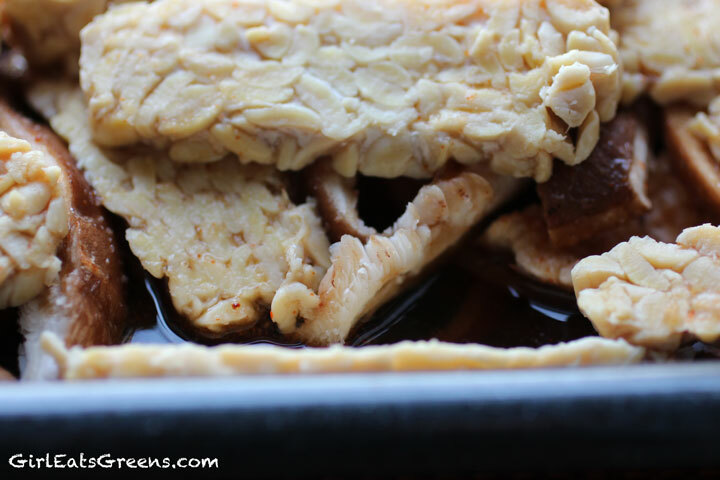 Layer the onions, mushrooms, and tempeh into a shallow pan. 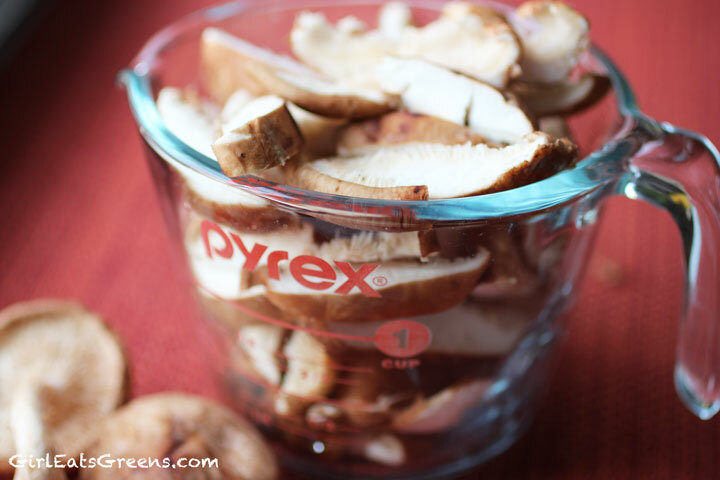 Pour the vinegar and spice mixture over top. Cover, and let it marinate overnight. 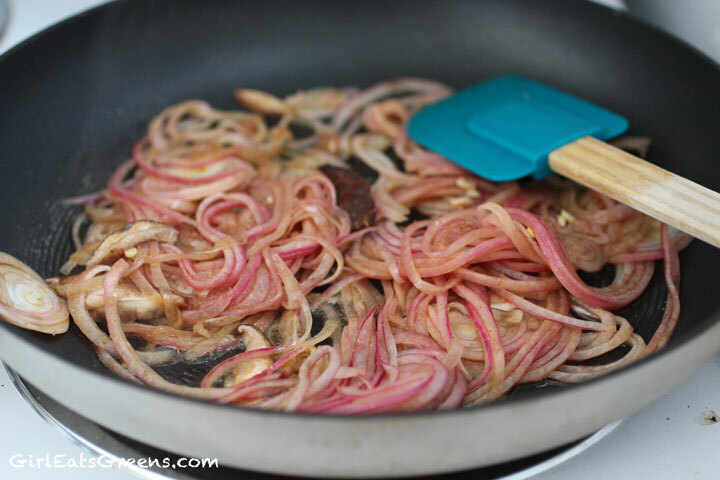 The next morning, separate out the onions and mushrooms, and cook them a bit over medium heat in a greased skillet. 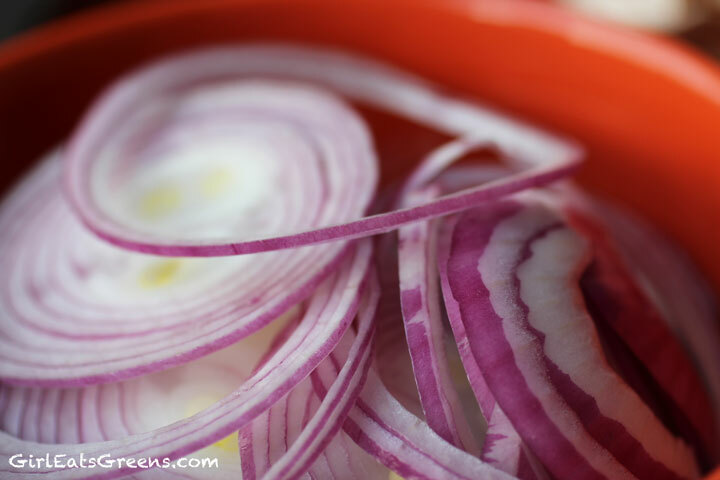 You’ll want the onions to be fully cooked to cut some of their strong flavor and let them get a little caramelized. 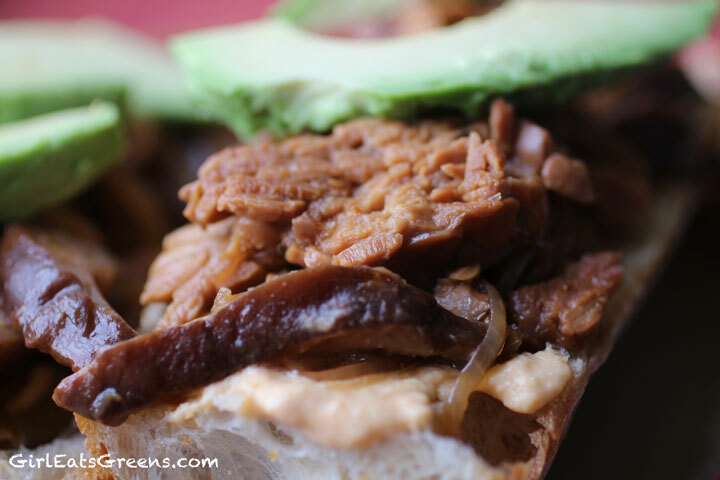 Add the tempeh at the end for a little searing action. 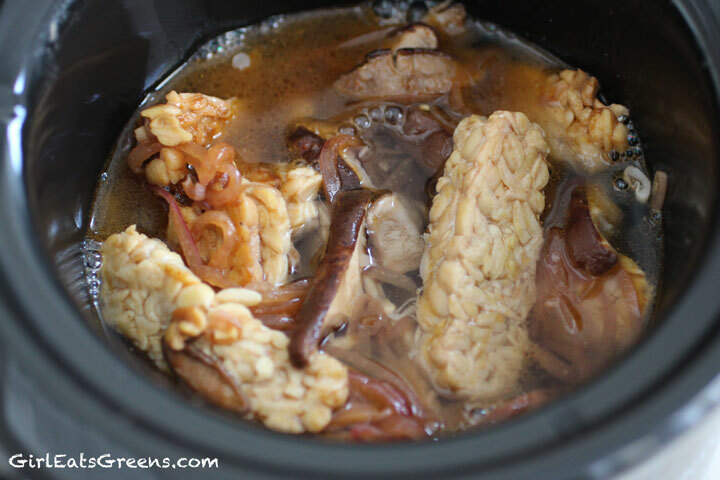 Then add the marinade, tempeh, mushrooms and onions to a slow cooker on low. Add one cup of water and cover. 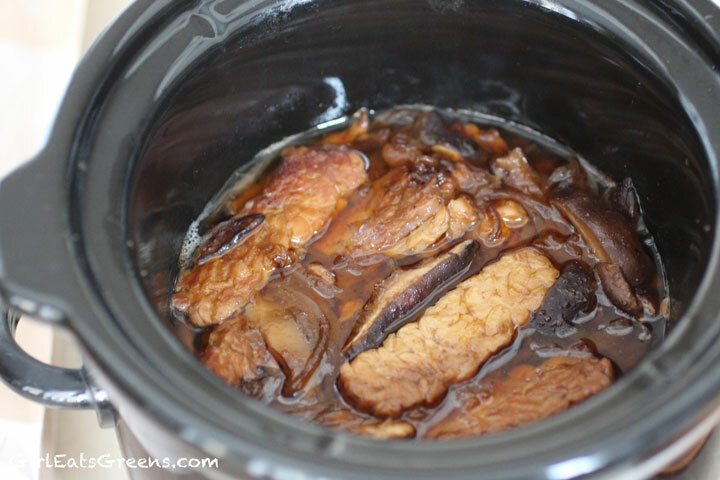 Let the mixture simmer for 4-5 hours. 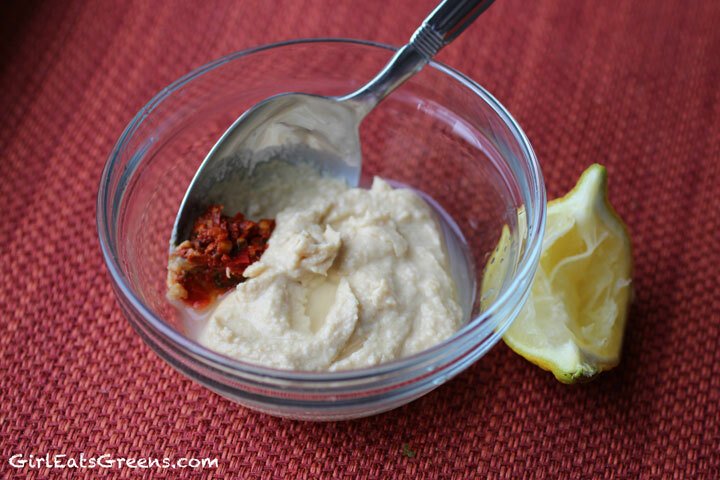 When you’re ready to eat, mix the hummus, harissa, and lemon juice for a spicy sauce for the sandwich. 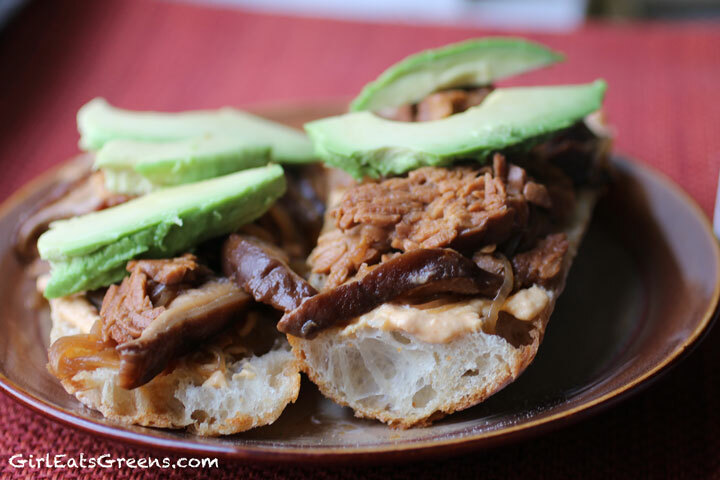 Slather the hummus on crusty bread, top with onions, mushrooms and tempeh and sliced avocado. 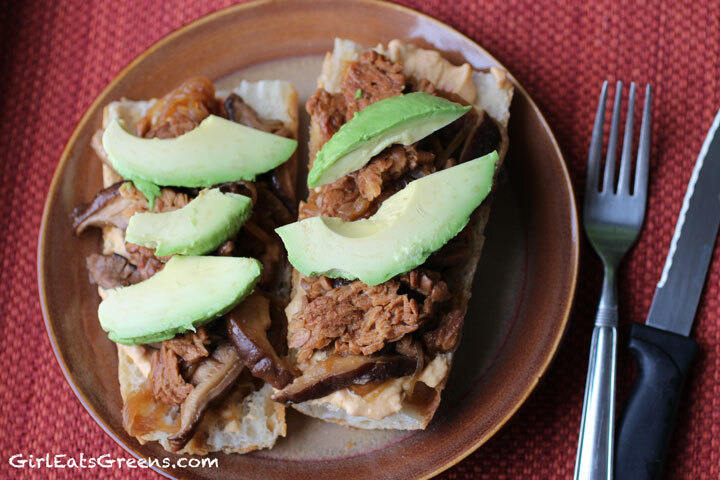 I served the sandwich open-faced because it was so huge. This sandwich was definitely a hit with R. It is pretty manly. Or just made for a large appetite. It wasn’t quite the same as Monty’s but will definitely find a place in our regular rotation. And I could see serving this to non-vegans and having it go over quite well. 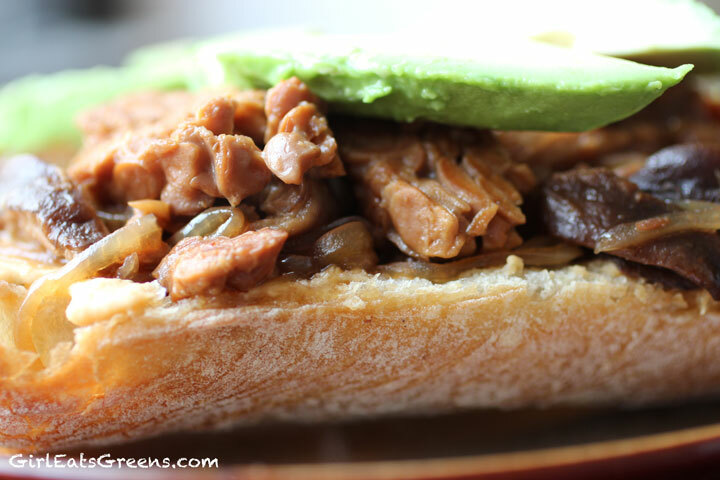 That sandwich looks fabulous! 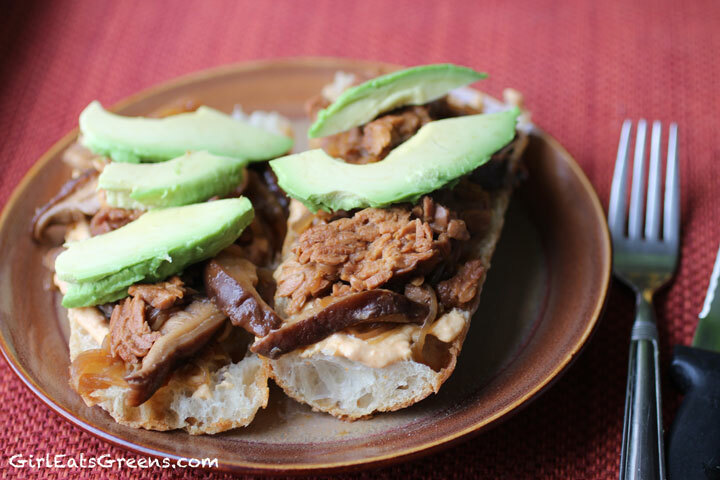 Any crusty bread with avocado, and I’m on board! Oh man, this looks so good! I am making a sandwich now! This looks so interesting. 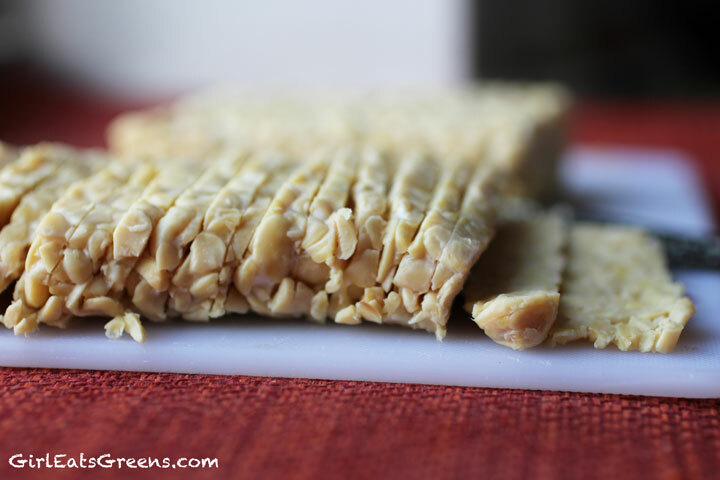 I’ve never made anything with tempeh – I’ll have to try it. This pic made me hungry :O! Looks so good..